It was my second weekend at college and I knew I wanted to visit a few different churches. I wanted a place to call home throughout my college experience. The second church I visited, I attended by myself. I was immediately welcomed into the church with smiling faces and friendly gestures. It was a few days later that I received a Facebook message from the youth minister asking if I would be interested in their college group. I expressed that I wanted to be very involved and would not mind helping with the youth group either. He invited me to help with a youth lock-out and I agreed. Despite my shy beginnings, this led to my becoming a youth ministry intern for four years. This little gesture turned into a valuable and meaningful experience. It turned into something that felt like a calling. From then on, I stopped trying to push this call aside and I focused on my ministry at hand. I wanted to learn more about what this call was all about. A couple years went by and I invested as much as I could into the youth ministry. I began to consider a calling to pastoral care and counseling. I found myself passionate about listening to others and enjoyed experiences where I could be a pastoral presence. I spoke to our pastor, Joel Snider, and expressed this potential calling for pastoral care and asked his opinion. Among many other things, he told me, “The church needs you.” While it may not have had immediate impact on me in that moment, it has certainly impacted me throughout my early seminary career. In my first few weeks of class this semester I felt overwhelmed with excitement for this new journey. I actually want to do my schoolwork! I feel passionate about the things I am learning and how I can apply them to my life in ministry. All the while I have had those words in the back of my mind. What does it mean that the church needs me? I’m a part of the church. I’m active in church and embrace the diversity that church can bring about. What does it really mean to have the church need me? As I have sat through lectures and listened to others share their stories and experiences, those words have stuck with me and have continuously resonated inside me. I have realized that to be a member of the body of Christ, we are all called to offer ourselves to the church. Our unique, quirky, meaningful, God-loving selves. The church needs all of us, every little bit of us. It’s those small parts of us that make the church what it is. That is what makes the church so diverse and such a wonderful thing to be a part of. The church needs us. And that is where I am called to be. I am called to be part of the greater church as a whole; providing the bits and pieces of myself that I might not think are all that great because that is what the church needs. We should stop worrying about what people will think of us if we say this or that and be who God has created us to be. Nothing else matters. Anna Kate Wilson is a CBF Leadership Scholar in her first year of seminary at McAfee School of Theology in Atlanta, Ga. 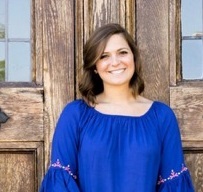 Originally from Birmingham, Ala., she currently serves as the Student.Go Intern with CBF Global Missions and as the Director of Children’s Ministry at Northside Drive Baptist Church.